The very best gift for parents EVER! NOTE: This article was originally posted on December 3, 2015. It’s been updated to include a NEW discount code for 2017. Enjoy! Looking for the perfect Christmas gift, Hanukkah gift, birthday present or baby shower gift to buy a parent you know? Well we already told you about the second-best gift for parents you can give – so there’s certainly no shame in getting somebody one of those. But if you really want to wow all the child-rearers on your shopping list, you need to go for the gold, shoot for the stars, spare no expense and get the very best gift any parent could ever hope for. 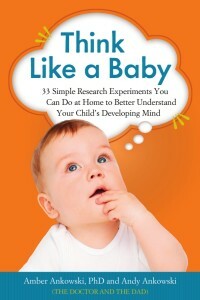 Think Like a Baby: 33 Simple Research Experiments You Can Do at Home to Better Understand Your Child’s Developing Mind! And we’re not just saying that just because we wrote it. Why is Think Like a Baby such a great gift? It’s useful – Think Like a Baby helps parents, grandparents, aunts, uncles and childcare workers get inside kids’ heads like never before. It’s full of activities for you to do with the children you know that will give you tremendous insight into what’s going on inside their little brains at all different points of their mental, physical, emotional and social development. It’s fun – Although the activities in the book are based on classic child development experiments that psychologists and researchers have used to learn about children for decades, they just seem like fun little games to kids! It’s a gift that keeps on giving – The experiments in the book can be used to learn about kids from the time that they’re still in the womb, all the way to age seven and beyond. It’s an experience, not just an object – And research shows that those can be the best things to spend money on anyway! It makes their lives easier – Think Like a Baby is packed with tips to benefit kids and parents. 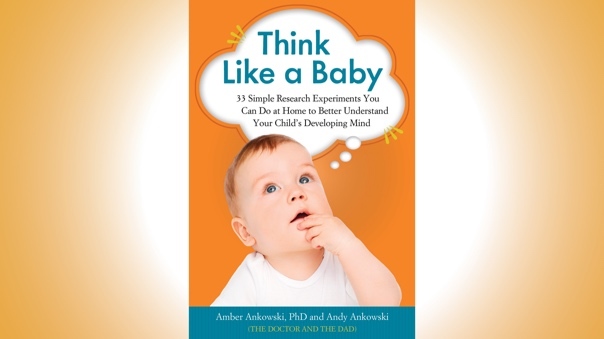 Following each experiment, readers get “Tips to Help Your Child,” for easy ways to promote children’s development in the specific area that the experiment covers, plus “Tips to Help Yourself” for advice about how to use what the experiment has taught them about children’s thinking to their own advantage. Now that I’m convinced that I need it, where can I find Think Like a Baby? Buy Think Like a Baby today anywhere books are sold, including Amazon, Barnes & Noble and Chicago Review Press! Why YES! From now through December 31, 2017, Chicago Review Press is offering Think Like a Baby (and all the other books they publish) at a 50% discount to authors’ friends and family like you. Just enter the code HOLIDAY2017 right now! We hope you’ll read more about this amazing parenting book here, buy copies for yourself and all your baby-raising loved ones today, and maybe even leave us a great review on Amazon too! Thanks everybody! And happy parenting!